January | 2015 | LIT.GAZ. You would expect me to say I love the English language, but I have been thinking about what it is that I particularly love; teaching the language and its literature gave me a career I loved, too. And yet my knowledge of the language in terms of its history, structure and linguistics is basically self-taught and rather patchy. I love the quirks and oddities of the language: the ‘th’ sound that foreigners have such difficulty getting their minds around the two different pronunciations of, and its utterly bonkers spelling rules, that I fervently hope no-one ever succeeds in ‘reforming’. One of the things I have come to realise and appreciate over the years is how vast it is, as a language, with far more words than any other language; the OED has twenty huge printed volumes and several volumes of supplements, and, as far as I’m aware, no other language comes anywhere near this. What this means is that there is a great wealth of synonyms – look at the size of Roget’s Thesaurus (a volume I’ve always possessed and never used! ); synonyms mean an ability to express more shades of meaning, and meaning with great precision and subtlety. And then, the sheer wealth of words mean that, for instance, there are far more rhyming words available to poets if they want them. English does seem to have developed into the closest thing there is to a world language; obviously this is a good thing in some ways, although I think it is also capable of getting in the way of communication, but it has also led to the English becoming very lazy indeed about learning other languages, and this is both sad, culturally, as well as a serious mistake in terms of our relations with the rest of the world. I am fascinated by the ways that our language has changed over time, from an inflected Germanic language via Norman French to the relative simplicity of today’s English. I say simplicity advisedly, because that perceived simplicity is one of the reasons for the falling off of foreign language learning in this country. But we have a grammar without the genders that French, German, Spanish, Polish and many other languages have, we have a grammar without the use of cases such as German and Polish have, and we have a very flexible word order to our sentences. Equally fascinating to discover has been the wealth of word experimentation and creation by our great writers such as Shakespeare and Milton. I have loved what my learning of foreign languages has taught me about my own language, in terms of connections in vocabulary and word origins, as well as differences in the ways languages develop and change. I find certain things about English to be annoying, or to be disadvantages, particularly some of the effects of sharing the language with the United States. Somehow, generic ‘mid-Atlantic English’ is rather soulless. One of the most fascinating, and also one of the saddest books I’ve read for quite a while. Nearly twenty years ago now, William Dalrymple travelled through various Middle Eastern countries on what seems to have been a personal pilgrimage, on the trail of the vestiges of the earliest days of Christianity. Through Turkey, Syria, Lebanon, Palestine and Egypt he shows us how Christianity was originally an Eastern religion and how it is now gradually and finally and probably forever being driven out. Islam developed in the same area; I was already aware of some of the shared beliefs of the two faiths but was astonished to read of them sharing the same places of worship in some remote areas, of them co-existing peaceably as they had done for more than a thousand years. An eighth century saint didn’t even recognise Islam as being a different religion: he wrote of it as another of the many Christian heresies rampant at the time. And Christian monks used to have prayer niches in their cells in the desert so that they could face in the right direction when they prayed… truly the two faiths were much more intertwined in their very early days that I had known. 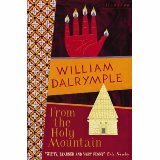 Dalrymple describes the remote desert churches and monasteries, many of them well over a thousand, some over fifteen hundred years old; the pictures he paints are vivid and haunting, and one realises how long places and relics are preserved by the heat and dryness of the desert; the vignettes of the monks and priests he meets and converses with are well-drawn, even though there is a lot that seems more than mildly bonkers about some of the beliefs and practices of the Byzantine churches…but the idea that there is more to this life than the purely material and the secular has been anchored there for centuries and still speaks to us today. He contextualises well; the confusion and anger that is today’s Middle East is illuminated as far as it can be; we live in an age of fundamentalists, and Dalrymple shows us Jewish, Christian and Muslim ones, all of whom seem to have regressed from their brethren of earlier times, hence the inevitable note of sadness that permeates the book, as we see Christians forced to leave the very areas where the faith began and developed. The situation has, of course, become far more grim since Dalrymple travelled and wrote this book. I found myself wondering how much responsibility the modern idea of the nation state bears for the current madness. I’d read a couple of newspaper and magazine articles by William Dalrymple but no books of his until this was passed to me: I look forward to reading much more. A serious tome on mediaeval history, specifically the Albigensian Crusade. For a long time, I’ve been interested in the Cathars and their castles in the Languedoc, but it’s taken me a while to get round to reading this book. In the late twelfth/ early thirteenth centuries the established Church was widely viewed as corrupt, and worldly, and a serious rival developed, the Cathar church, which came to command the loyalty of the entire region. Unfortunately, relatively little is known about its beliefs, practices and organisation, as it was ruthlessly and totally destroyed, and the subsequent accounts were written by the victors. The broader context was the development and enlargement of the kingdom of France, which meant the annexation of the Languedoc by whatever means. There were also petty rivalries between local lords and barons, and the thrones of England and Spain, and the Empire as well as the Papacy all wanting to advance their power and influence. The Church realised it needed to extirpate its rival; at first it used its power and influence over the temporal authorities, with great brutality; then it invented the independent Inquisition with powers to seek out and destroy heresy, arranging for it basically to have carte blanche from the local powers to do what it liked, an arrangement that suited both sides. I think what I found most shocking was what I can only describe as the Stalinist methods of the Church and the Inquisition to deal with heresy and heretics. A climate of insecurity and terror was created throughout the entire region, and this led people to denounce themselves and friends and neighbours in a bid to avoid more serious consequences; the idea that the Inquisition would keep to its side of any bargain was unlikely. Heretics – men and women, young and old were often collectively burned in dozens and sometimes hundreds because they refused to abjure their Cathar faith, and eventually the old religion disappeared. Oldenbourg’s account is masterly; some apparently think she was too sympathetic to the Cathars, but when you read her account, the established Church clearly loses any moral or spiritual authority from the very outset; although the Cathars were a rival church, all they sought was to be allowed to worship as they wished. There is an enormous amount of detail, distilled from available Inquisition documents and other sources; all is referenced. 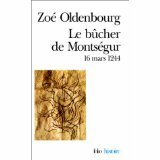 She explains in full and clear detail, as far as is possible, the beliefs and attitudes of the time so that her whole history is fully contextualised. She is open about the difficulty of coming at the truth; she is clear that in the end the issue was the independence or not of the Languedoc, and that the Church would have seen itself as having no other route than to try and destroy what was a serious alternative religion across a large area and therefore a major threat to its temporal authority. All in all, I found this an excellent work. I’ve realised that I have never thought of myself as a writer; a reader, obviously, and lifelong, but a writer? When students and colleagues used to ask if I’d be writing when I retired, I pooh-poohed the idea. I have always seen myself as a teacher, teaching others and enabling them to write. So what makes one a writer? Why all the diffidence? I realise, after further reflection, that writer has always meant creative writer to me – fiction, drama, poetry – I don’t know why! and so I’ve been pushed to a rethink. I’ve never felt able to write creatively, and, curiously perhaps, have never felt moved to take a creative writing course. And, pace all my ex-students, who I taught to plan their writing, and who probably thought ‘I bet he doesn’t go though this rigmarole’, this is how I actually do write: I follow my rules. I reflect, ruminate, make notes and log ideas for a while; I plan and draft – this last now usually onscreen but not always – and then I re-read, revise, correct and polish until I’m satisfied. This method comes naturally to me because, thinking back, it’s how I’ve always written and I’ve always found it effective. Now that I’m taking my blog seriously, I have found myself reflecting on what has happened to my reading as a result. Am I behaving any differently from before, when I was a teacher? I’m still reading as widely, and as randomly as I used to: there will be a series of books on a similar theme or by the same author, and then I will strike out at a tangent. You can see that from the sequence of this blog. I think, however, that I’m applying critical skills more sharply and widely. Studying literature, which I suppose I must date from when I studied English Literature at A level, involved gradually developing skills: this continued as I went to university, and then did post-graduate research, and afterwards went into teaching. These skills originally were focused on my reading of prose, poetry and drama, and involved exploring and understanding how a writer works to achieve effects, and evaluating her/his success. Understanding context was also crucial, at least in the ways I was trained. These skills have never left me (and I always used to be able to assure students who had taken their study of literature to a certain level and were then moving on to something different, that they had a reader’s toolkit for life), but I now find myself applying them to everything I read, whether literature or not. Evaluating and assessing a writer’s use of the language and their ability to communicate meaning effectively, as well as judging the quality of their argument, is what it is all about. So now, I’m finding myself thinking rather more deliberately as I read, and often jotting things down that occur to me; I reflect on my reaction, on what pleases or annoys me, and consider why. I have often been asked whether having studied literature spoils my enjoyment of what I read, and occasionally students have complained that analysing and studying a book too much spoils it for them; I’ve never felt that to be the case myself, as no matter what skills or analysis I bring to bear on a text, that innocent first reading is always there, the desire to know ‘what happens?’ and the thrill of getting to the end. Even in a non-fiction text, there is still that discovery of newness, and the wondering whether the whole will contribute in a helpful way to my knowledge and understanding. I love reading: somehow, it connects me to places, people and worlds I’d never otherwise encounter, and I feel more human because of this. There’s a lot of outlining and making clear the scope of the issues and problems involved in translation, necessary before he can explore translation itself. Meaning itself is complex and multi-layered, and so, therefore, is the task of conveying all that meaning into another language, where the words themselves, in that language, may not carry the same baggage, or may carry different baggage, and not what is wanted. 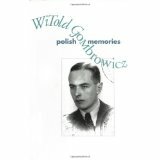 He explores issues from all angles, and differentiates between translation of the spoken and written word. I had no idea of the wide range of different sorts of translation that exist. The distinction between L1 and L2 translation (L1 is translation into your mother tongue, or native language – although he has interesting comments to make on those concepts themselves – and L2 is translation out of that language into another) is explored, and I finally came across clarification of the concept of ‘lectoring’ (I hadn’t even known the word before!) which is a practice used in parts of Eastern Europe when foreign language films are shown: the translated dialogue is read aloud by a single voice against a background where the original soundtrack is played at a lower volume, but still (almost) audible… think about it! Rules for subtitling and dubbing are much more complex and tricky than I’d ever imagined, too. He writes about a concept which I’ve been aware of for a long while; he doesn’t call it mid-Atlantic English, but it’s a simplified, neutered version of the language which eschews specific Englishisms and Americanisms so as to be as broadly comprehensible as possible to the widest audience, including both E1L and non-E1L speakers; the issue is clearly that certain things – subtleties, nuances or whatever – surely do get lost in this kind of translation. It was fascinating – not unflawed, but as good an introduction to the subject as a general reader could wish for, and I can think of some of my readers who would enjoy it. 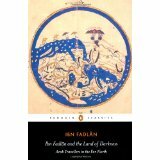 Anyway, I’ll get my complaints in first: the title’s a bit of a cheat since less than a third of it is actually Ibn Fadlan’s travels. The rest is excerpts – very interesting, too – from other Arab travellers of the period. There’s also an awful lot of wasted paper, with nearly blank pages at the end of lots of sections, and fourteen (!) 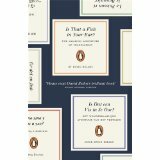 pages of puffs for other Penguin books at the end. However, a wide range of otherwise unobtainable Arab travel writing is made accessible here, in a good translation, to a wide readership; the accounts are fascinating in different ways, and the maps (several) are excellent, clear and detailed, which is very unusual for today’s publications. So in the end, the book is a good effort. Educated, literate men from various parts of the Arab world, curious and questioning, were travelling very widely in the years up to the end of the first millennium and after. They seem to cover most of Europe, including Baltic lands, Sweden, Poland and other places, before some of these attained nationhood, even. Places are named and described. Some voyagers penetrate into the depths of present-day Russia (before that nation was even named) and as far as the fringes of Siberia. Ibn Fadlan is noted as the only traveller to have witnessed and described in detail, a Viking ship burial. I’m aware of fewer Western travellers who wrote similar accounts in what are commonly misnamed the Dark Ages. It’s clear that more than a thousand years ago there were extensive trade routes all across these regions, because of the market for furs. The customs and lifestyles of tribes and their religious practices are described in some detail, sometimes with an impartial eye, sometimes rather more critically and disparagingly. There is the clear impression of Jews, Christians, Muslims and pagans managing to co-exist reasonably peaceably. I think Hopkins is probably as much of a minority taste in poetry as Milton, nowadays: both are ‘difficult’, or take some serious effort to access, though both are well worth it; both very religious, though at opposite ends of the spectrum – you can’t get farther apart than a Puritan and a Jesuit – and both were serious experimenters with language and verse. I tried to get my head round ‘sprung rhythm’ when we ‘did’ Hopkins at university and failed abysmally; it was only when my job as teacher meant that I had to pick up someone else’s work on Hopkins’ poetry halfway through that I really came to appreciate him. And for a teacher of literature, in some ways Hopkins is a godsend. With Hopkins, you finally ‘get’ the crucial importance of reading poetry aloud: on the page it looks and reads like a nightmare. It takes several goes to parse it orally, but the revelation is stunning: nobody illustrates all the poetic techniques so fully and perfectly. There is rhyme in abundance, there is the rhythm (sprung or not!) all of Hopkins’ own. There is alliteration with real purpose, at least as much assonance as you could wish for: no-one revels in the gorgeousness of sounds as much as he, in the fullness of English words. And enjambment – well, who could have imagined it could be used so dramatically? not Shakespeare… Hopkins revels in words, and the ordering of words, to slow us down, make us stop, ponder, and then… the moment of epiphany! But it’s poetry, too, not just beautifully honed technique: a devout Catholic who joys in the beauty of the world his God created, in masterpieces such as God’s Grandeur, Pied Beauty or The Windhover (how that bird moves! ); also a man tortured by depression and suicidal thoughts: who can be gloomier than the writer of No Worst, or Carrion Comfort? though he seems to come back to his God in the end. And: is it possible to do more with the sonnet form than Hopkins has done? he pushes it to its limits, it seems; but then, that’s the difference between him and me: he was a poet and could imagine such things; I can only wonder. I don’t come back to Hopkins very often, now, but thanks for the reminder, Sam.